Loved my plant. They were stunning and moist when I opened the bag. Couldn't be happier. Super easy to grow. I still can't believe it. Spreading Phlox Plants will make a fantastic ground cover. This plant will have tiny flowers that will look amazing when they are in bloom. This plant is a native plant of the US and can grow in most areas. It can be found along roadsides. This plant loves moist soils and mildly acidic. The flowers on this plant can be blue, purple and pink and will only be around 1 inch wide. Spreading Phlox type of plant is fantastic when added to bare areas in a garden or natural area and provides a beautiful and colorful ground cover. Spreading Phlox supplies tiny flowers that appear in spring and early part of the summer months and adds bright and vivid color as they are in bloom. Spreading Phlox plants also look great when added to large planters such as wheelbarrows and other large flower pots, and as they grow, they seem to cascade down over the sides and provides a gorgeous look and feel to all areas where they are added. They are very easy to grow, and gardeners love them. 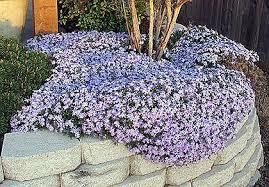 Spreading Phlox work great is all types of landscaping projects that a homeowner may want to create. Spreading Phlox are also called Diffusa. These plants can bloom in purple, blue, pink and too a bright white. They provide a beautiful and dainty look as they grow and bloom. The Spreading Phlox, also known as the Creeping Phlox, Moss Phlox or Phlox Subulata, is an herbaceous perennial indigenous to the eastern and central United States. Caring for this plant does not require much maintenance, only medium water, and full sunlight. The Spreading Phlox grows to be about six inches tall and about 24 inches wide. Spreading Phlox blooms in April and May, producing a spectrum of red, purple, pink, and white flowers that are responsible for the Phlox name, which means "flame" in Greek. The Spreading Phlox is also known to attract butterflies, conveniently adding to the plant's overall beauty.